Data Perimeter Security solutions like SIEM, IAM, UEBM and others provide some level of access control to business networks, applications and data. 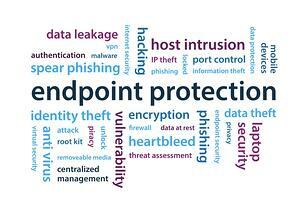 They are focused on the ‘first line of defense’ – users and devices to provide a ‘Proactive’ solution. They are fundamentally critical in achieving a total data security profile in any business environment, especially in situations where users and devices number in the hundreds to thousands. This ‘Proactive’ approach attempts to mitigate unauthorized access to businesses, mission critical networks, applications and databases by cyber attacks. So what happens when a breach occurs through these ‘Proactive’ and ‘first line of defense’ systems? Under various terms with some overlapping functionality and features, Endpoint Protection provides virus protection, whitelisting of approved sources, and reporting of the malicious access with alerts followed by quarantine. Solutions like Symantec, McAfee, Kaspersky and many others (over 40+) provide various levels of protection if setup properly as a ‘second line of defense’ once access is compromised. They are ‘Reactive’ solutions that should compliment the ‘Proactive’ solutions protecting the data perimeter. Unfortunately, they are typically not integrated with the ‘first line of defense’. Rather, they are a ‘second line of defense’ focused on malicious access, code and the sources they originated from. Being both ‘Proactive’ at the ‘first line of defense’ and ‘Reactive’ at the ‘second line of defense’ can certainly help mitigate data theft and loss, particularly with disparate IT infrastructure systems. However, what about the ‘last line of defense’, the applications, and data at the heart of your business? Is it possible to be ‘Proactive’ at the ‘last line of defense’ after the first and second lines are breached? Encryption utilizing cryptology techniques like Key Management and Tokenization at the application and data level ensure just that. If a breach occurs, the attack vector has been minimized and mitigated; rendering any data compromised useless to the attackers. With Tokenization and Key Management, parties agree to secure data access as well as exchange parameters between trusted partners, entities and systems (like POS systems). Without allowing all the data to be ‘open in the wild’, this allows selective exposure to limited data segments. Being ‘Reactive’ takes on a different context, meaning, and purpose with this type of data security initiative. It means that being ‘Reactive’ to the onslaught of cyberattacks, data breaches and theft by implementing encrypted data solutions is a ‘Proactive’ response. Whether you’re in a position of being ‘Reactive’ or ‘Proactive’, or somewhere in between trying to sort it out, taking the initiative to protect the ‘last line of defense’ with encryption is vital. In fact, it can be the single most important, immediate and critical data security initiative any business owner and technology professional should consider.